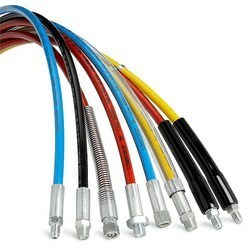 Our range of products include high pressure hose. Ultra High-Pressure Hose for hydraulics is spiralized steel reinforced polymer that has ultra-high working pressure with maintained flexibility. Its low volumetric expansion gives fast response time in hydraulic systems while smooth inner bored provides a minimized pressure drop. The small outside diameter makes the hose ideal for tight routing. Each assembled kit is cut to your preferred length, fitted with one of our wide range of fittings and high-pressure couplings.